Can you spot John Pears in this picture of St. Chad’s in 1959? Sitting front row second guy in looks like “Jimmy” Pentland may have the christian name wrong!! 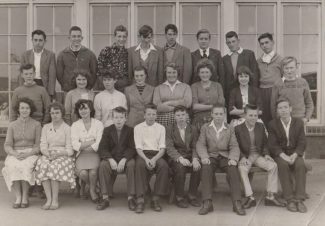 top row left Horace Lee, numb 6 Dennis Hewitt middle row left John Pears front row second left Joan Barton fourth left Ian Hart eighth from left John Pentland. nice photo, front row far right Ray Skipp, fifth from right Butch Trappit, middle row far right Colin Hutchinson front row third from right looks like Norman (tosher) Archer.